Another relaxing weekend just about over. We finally put together the exercise bike and did a ton of laundry this afternoon. Other than that, Allen and I just hung out and enjoyed each other’s company. I did get some good stitching done on the map. 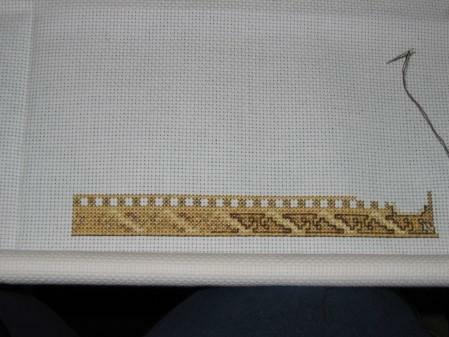 I completed about a six inch section of the border in the top right corner. I think I will finish the remaining back stitch in the border I have completed and then it is time to move on to Woodland Fairy again. I am also trying to pick a small project to work on. Maybe I will pull together a few options and put a poll up in the next few days. That would be fun. Here is a pic of my progress on the map. Keep in mind I am stitching it sideways. 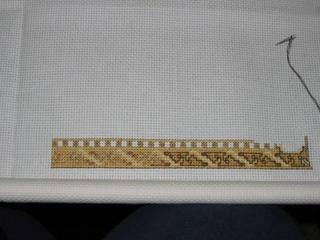 The scroll rods I have were only long enough to hold the fabric if i stitched the project sideways. I may have to invest in some really long scroll rods at some point.